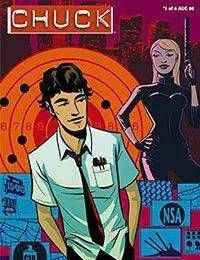 Chuck Bartowski had a secret computer downloaded into his brain--and ever since, his life as part of the Nerd Herd has beenThe hit NBC television series comes to comics as Chuck Bartowski and his friends take the world by storm--literally, in an adventure too big for television! In this globe-trotting, action-packed episode, Chuck will visit exotic locales, dodge numerous bullets, and be tortured by the worlds greatest...tickler?<br />Plus a 1 page back-up story by Phil Noto, Captain Awesomes Tips For Being Awesome! interrupted by secret missions and random attacks. Agents Walker and Casey have done their best to keep him out of trouble, but sometime all they can is to keep him alive!